Encouraging them to explore their sense of touch can help them with either getting the sensation they need or helping them learn to cope with it. In the same way some of us love the idea of slime, other cringe at it - but on a whole other level! Sensory play also helps kids develop the ability to focus on what's important, tuning out irrelevant stimuli (or 'white noise') in the environment, to manipulate and mould materials, building up their fine motor skills and coordination. Here's recent activity creating a slimey baff for the kids plastic toys. 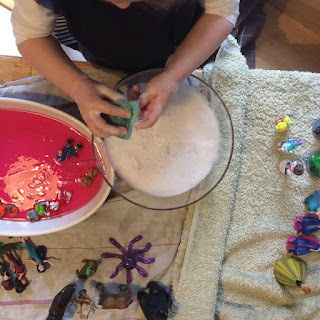 It gets the kids an experience of wet textures, uses items they know and play with, motor skills and finally reinforces as activity at home - that of getting washed. 1. First we made put some towels down on the table we were going to use. Even if everything starts off in a bowl, it doesn't always stay that way! 2. We created a big 'slime bath' using the simple Zimpli Kids granules and water in a big oval oven dish. If you want to make the slime more 'gooey' you can simply add more granules till you get to your desired consistency. The Slime Play and Slime Baff are both non-irritant and stain free which is handy. However, it is non-edible so if your kids are in the habit of sticking sensory play materials into their mouths they can try this out with some simple food stuffs. A (pretend) bath of baked beans works well and tinned spaghetti is like playing with a bath of sea serpents according to my youngest. Then we also made a 'rinsing bowl' of soapy water. 3. We got the plastic toys bathing! 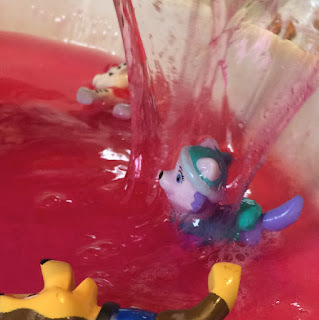 The kids moved the toys around in the slime so they were 'swimming' around and they also spent a good deal of time 'sliming the various characters by picking and scooping the slime and letting it goo out of their hands onto the characters. This was really good for their sensory feedback and their imagination. 4. Once some of the toys had their slimey fun we moved them into the 'rinsing bowl' of soapy water for cleaning the toys in after their slimey bath. This was great for the kids motor skills. We used a sponge to clean all the slime of the toys and then laid them out onto the towel to dry. We went through several movies and TV shows of toys until they were all slimed and washed. 5. Lastly clear-up. Getting the kids to help us clear up is part of the task too. While they put their toys away, I was able to dilute the Slime Play with lots of water and then it simply goes down the sink and dropped the towels into the wash. If you used baked beans or spaghetti you may need to put in an extra stain remover like Ace to get the stains out of any clothes or towels. This is a simple liquid added straight to the wash at the beginning or as a spray. You can run the clothes and towels on an extra rinse cycle and this will help remove any irritants and you can also use a sensitive non-bio and conditioner such as Surcare for sensitive skin and kids with sensory issues around their clothing. Have you got any great sensory education ideas? 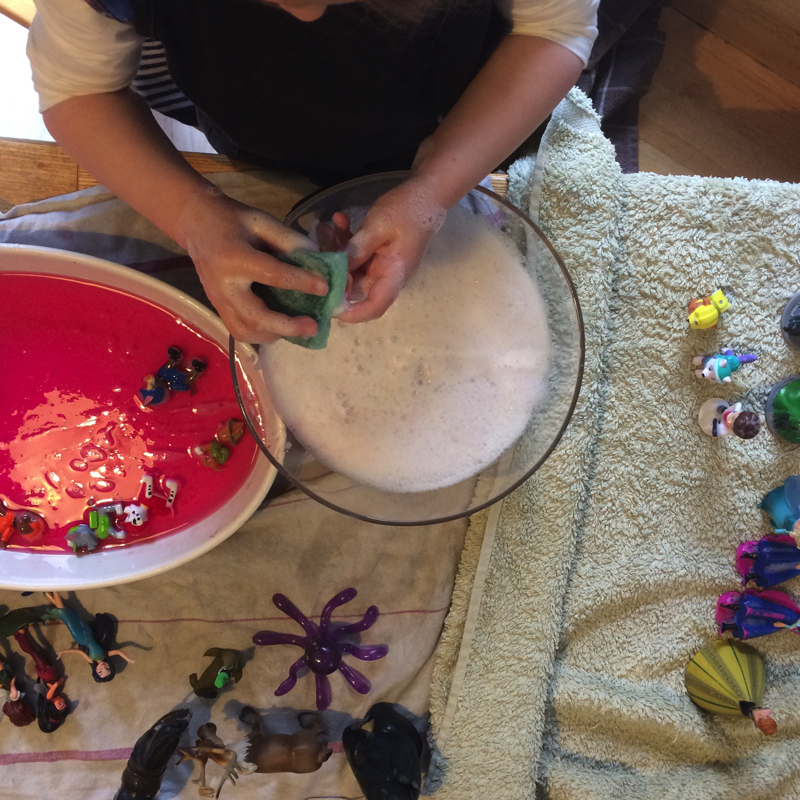 We were sent samples of Slime Baff / Slime Play from Zimpli Kids for purposes of review and are happy to include in our post - we loved it! Looks like a good play. Since working with a dissertation writing service company, I must say that kids will always love it and it will be nice experience to have it.